The EARLINET ACP Special Issue aims to collect high-quality aerosol studies employing advanced lidar remote sensing techniques as developed within EARLINET, the European Aerosol Research Lidar Network. EARLINET was established in 2000 with the main goal of providing a comprehensive, quantitative, and statistically significant database for aerosol distribution on a continental scale. The 5-year EARLINET-ASOS (Advanced Sustainable Observation System) EC Project (2006–2011) has strongly contributed to optimizing the operation of the network. EARLINET is now a key component of the ACTRIS (Aerosols, Clouds and Trace gases Research InfraStructure Network) research infrastructure project that aims to integrate European ground-based stations equipped with advanced atmospheric probing instrumentation for aerosols, clouds and short-lived gas-phase species. The 15-year EARLINET database of aerosol profiles over Europe will be utilized in this Special Issue to reveal the network’s contribution to atmospheric and climate research. The fine temporal and spatial scale analysis of the aerosol optical properties is presented based on the lidar measurements in Warsaw during the heat wave on August 9th–11th, 2015. The signals from quasi-continuous PollyXT-UW lidar measurements provided the high quality sets of profiles. In the study the statistical approach to aerosol layers characterization by the means of optical properties were adopted. Obtained data set have the potential to use in the fine scale microphysical retrieval. In order to increase the accuracy and validate satellite-based products comparison with ground-based reference observations is required. In that direction, we present the evaluation activity of EARLINET for the qualitative and quantitative assessment of NASA's CATS lidar operating onboard the ISS while identified discrepancies are discussed. The better understanding of CATS performance and limitations provides a valuable basis for scientific studies implementing the satellite-based lidar system. In this study we show the capabilities of combining different remote sensing systems (microwave radiometer – MWR, Doppler lidar – DL – and elastic lidar – EL) for retrieving a detailed picture of the PBL turbulent features. Concerning EL, in addition to analyzing the influence of noise, we explore the use of different wavelengths, which usually includes EL systems operated in extended networks, like EARLINET, LALINET, MPLNET or SKYNET. Smoke plumes generated in Canadian fire activities were elevated to the lower stratosphere and transported from North America to Europe. The smoke plumes were observed by three lidar systems in northern France. 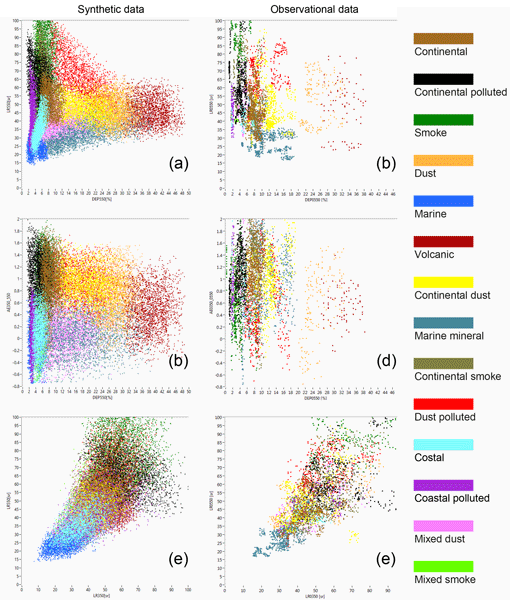 This study provides a comprehensive characterization for aged smoke aerosols at high altitude using lidar observations. It presents that fire activities on the Earth's surface can be an important contributor of stratospheric aerosols and impact the Earth's radiation budget. The episode of elevated sulfate aerosols over Eastern Austria in the period 01–06 April 2014 is analyzed using in-situ measurements, EARLINET lidar measurements, CAMS reanalysis data and backward simulations with the FLEXPART Lagrangian dispersion model. It was found that the lowest layers came from Central Europe, while at higher levels, also sources in NW Africa and the Eastern US contributed. The methodology can be used as a tool to relate in-situ and EARLINET measurements. 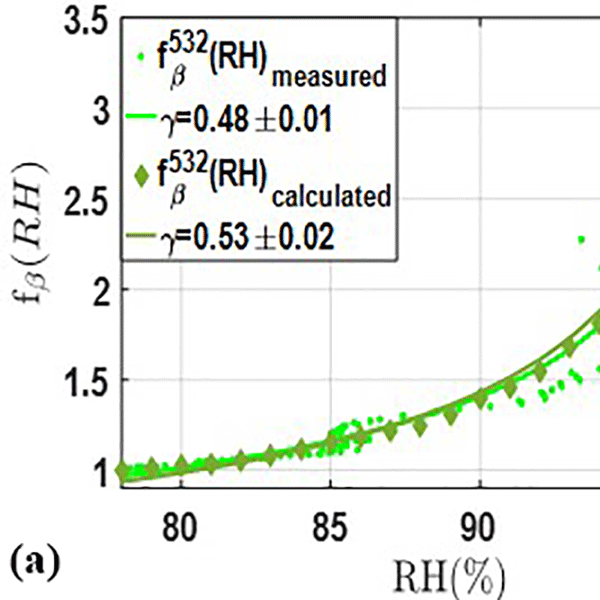 In this study we compare two automatic algorithms for the characterization of the aerosol layers derived from a Raman lidar and we test their application over a specific environment in continental Thessaloniki. The overall consistency of the aerosol typing between the two automatic procedures despite the different aerosol type definition, allows their applicability to lidar data for characterization purposes. 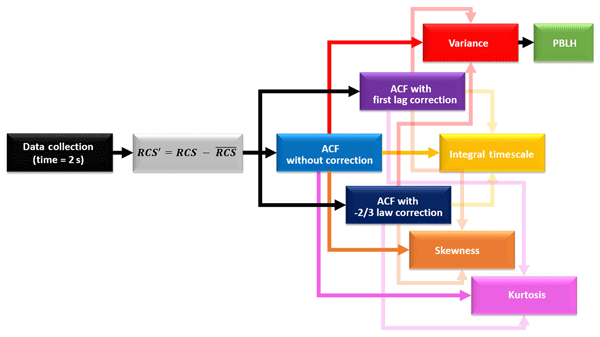 A new aerosol typing algorithm based on artificial neural networks (ANNs) has been developed. The algorithm is providing the most probable aerosol type based on EARLINET LIDAR profiles. The ANNs used by the algorithm were trained using synthetic data, for which a new aerosol model has been developed. Blind tests on EARLINET data samples showed the capability of the algorithm to retrieve the aerosol type from a large variety of data, with different quality and physical content. In this study we investigate the climatological behavior of the aerosol optical properties over Thessaloniki during the years 2003–2017. For this purpose, measurements from two individual networks, the European Lidar Aerosol Network (EARLINET) and the Aerosol Robotic Network (AERONET), were deployed. The analysis implies that the EARLINET sampling schedule can be quite effective in producing data that can be applied to climatological studies. 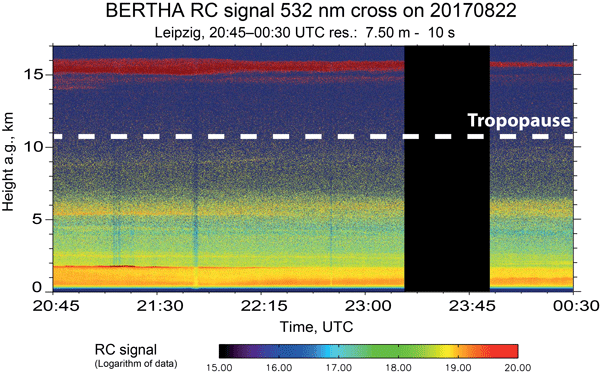 The worldwide only triple-wavelength polarization/Raman lidar was used to measure optical, microphysical, and morphological properties of aged Canadian wildfire smoke occurring in the troposphere and stratosphere over Leipzig, Germany, in August 2017. A strong contrast between the tropospheric and stratospheric smoke properties was found. 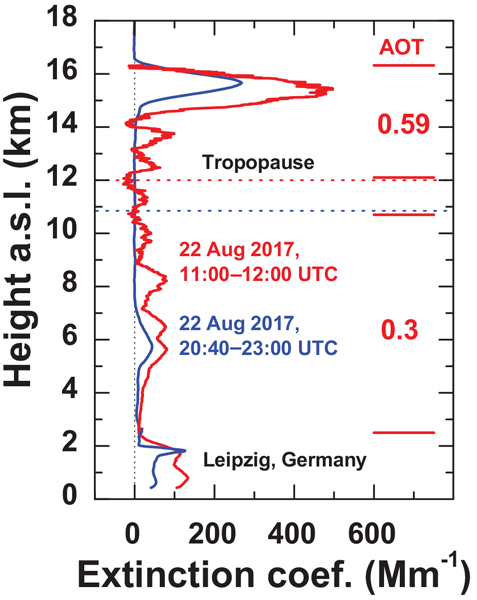 Extremely large light extinction coefficients of 500 Mm-1, about 20 times higher than after the Pinatubo volcanic eruptions in 1991, were observed by EARLINET lidars in the stratosphere over central Europe from 21 to 22 August, 2017. This paper provides an overview based on ground-based (lidar, AERONET) and satellite (MODIS, OMI) remote sensing. This study focuses on the analysis of aerosol hygroscopic growth during the SLOPE I campaign combining active and passive remote sensors at ACTRIS Granada station and in situ instrumentation at a mountain station (Sierra Nevada station, SNS). The results showed good agreement on gamma parameters by using remote sensing with respect to those calculated using Mie theory at SNS, with relative differences lower than 9 % at 532 nm and 11 % at 355 nm. This study presents an evaluation of an air quality model using aerosol measurements from radiometric and lidar data at Thessaloniki, Greece. The aerosol mass concentration profiles of CAMx are compared against the fine and coarse mode aerosol concentration profiles retrieved by the Lidar-Radiometer Inversion Code (LIRIC). The CAMx model and the LIRIC algorithm results were compared in terms of mean mass concentration profiles, center of mass and integrated mass concentration. An extreme dust storm affected Middle East and the Eastern Mediterranean in September 2015. This event was produced by a combination of meteorological and land-use properties. Analysis with remote sensing observations and modeling simulations reveals (i) transport of warm moist air from the Red and Arabian seas, (ii) formation of a thermal low over Syria, (iii) convective outflows and haboob formation (i.e. propagating dust walls), and (iv) changes in land-use and dust erodibility due to war. The ESA-funded SACS-2 and SMASH projects developed and improved dedicated satellite-derived ash plume and sulfur dioxide level assessments. These estimates were validated using ground-based and aircraft lidar measurements. The validation results are promising for most satellite products and are within the estimated uncertainties of each of the comparative data sets. The IASI data show a better consistency concerning the ash optical depth and ash layer height. Satellite-derived products must undergo data evaluation with reference data sets in order to identify any possible reasons of discrepancy or to assess their representativity. In that direction, data coming from CALIPSO satellite were compared with observations from the ground. We identified a CALIPSO underestimation that could be linked to an assumption in the satellites' algorithms. The proposed correction improves the performance and could enhance aerosol modeling.